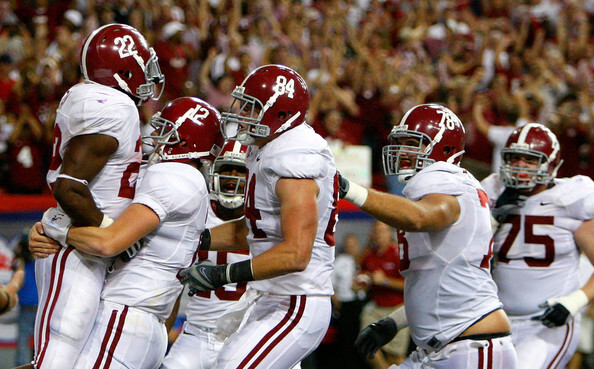 Alabama Football fans will remember this as the “Blackout” game. Alabama sprinted out to a quick lead and then capped it off with Julio catch to leave Georgia stunned going into halftime. 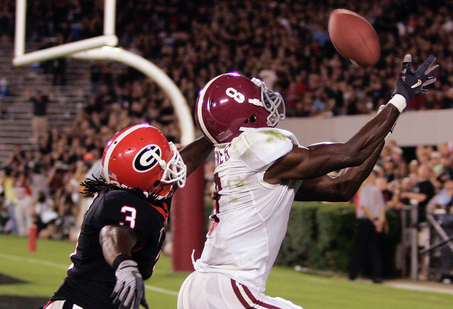 It was Julio Jones’s first big play of his career, but it certainly wasn’t the last for Alabama football. It is also appropriate that Julio Jones starts off the Coach Saban Era Top Ten Plays because he was the first big recruit Coach Saban landed. RMFT. I am pretty sure that Trent decided that he wanted to score a touchdown so he just did it. He was hit, first, in the backfield and then he continued to shed tacklers until he was sprinting past the Arkansas defensive back to Bryant-Denny pay dirt. The total damage for the play was 52 yards, 6 Arkansas tackles broken and 11 Arkansas defenders embarrassed. I was sitting on the same side of the field that he made the run and I could barely believe my eyes. My friend and I each took a shot out of our flask for the effort. 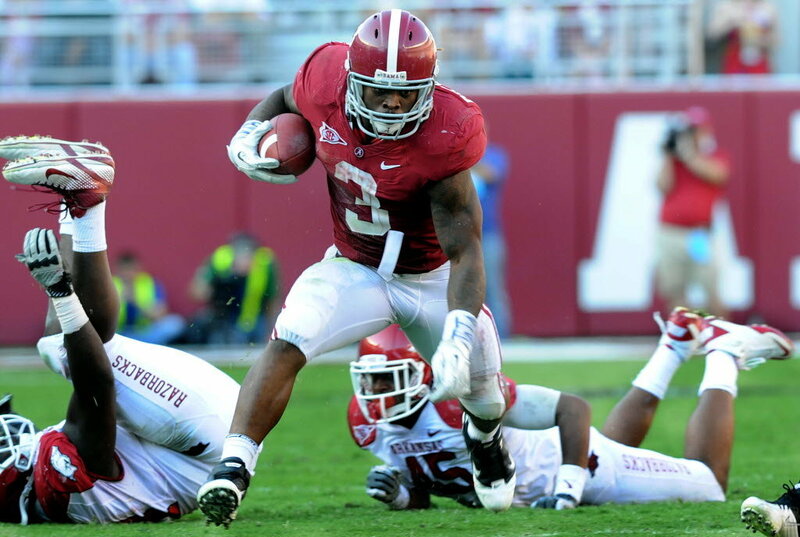 It was my first Trent Richardson moment and it was a great Alabama Football moment. 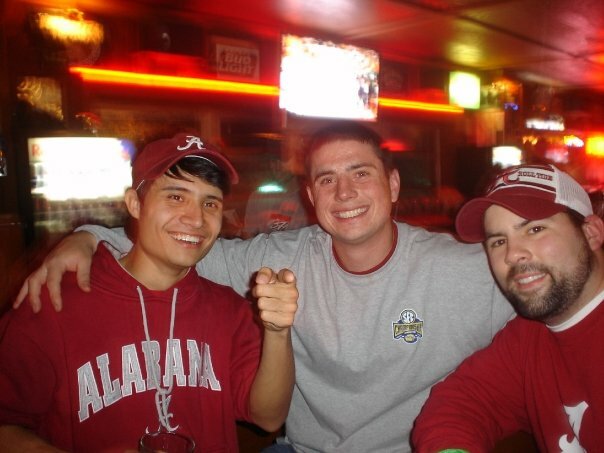 The ’09 season was amazing and Mark Ingram was a huge reason for Alabama football’s success that season. Going into the season everyone knew that he had talent, but no one expected what he did in ’09 to happen. This play came late in the opening game against Virginia Tech and his quote into the camera was the last thing that every watcher of ESPN’s College Football Live saw at the end of every show. I honestly believe that this quote had more to do with his Heisman win than most people remember. There is no doubt that ESPN influences the Heisman voting and it didn’t hurt that Mark Ingram was the last face and voice they heard on their daily college football show.